See my blog stats and thoughts for the first half of the year. Moved to a weekly schedule! I was usually writing every second week, but then I’ve experimented with a weekly schedule… and it worked out quite nicely! I hope I’ll be able to continue with such pace. One year ago I’ve started the list, it was getting like a few people per month. Then with C++17 Ref Card, the number of subscribers skyrocket :) For example, today, I’ve sent the newsletter to 1700+ people! It’s 2017, so we need to talk a lot about the new features of C++17. As you see, most of my posts are related to the language changes. Somehow my readers are still not bored with that! Just an experiment, but it’s so amazing. The blog grows, but also the costs. Not to mention the fact that I like the idea of getting some real money out of my writing. So far it’s only a tiny addition, but I am doing various things to increase revenue. Installing ads on the blog might not be the best, and it spoiled the layout… still it’s not hopefully that horrible. I’ve prepared a separate site about possible options to collaborate/advertise - take a look here: Let’s work together. Improve the posting pipeline. Keep the quality (or improve it), but reduce the time needed to publish an article. Working on that, but I think the pipeline is better anyway as I write weekly. Done! I moved to the weekly schedule. Only one break at the beginning of June (but newsletter was sent). I think doing a one week break doesn’t hurt, only longer breaks like one… two months. It’s hard to return after such break. Start with some products? Like little self-contained tutorials? Tips and tricks? Bonus content? Not fully done, but I’ve been thinking on that. 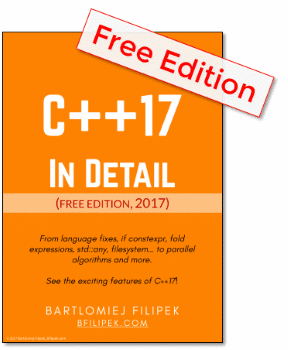 There’s also C++17 Ref card, which is a tiny/free product. I didn’t do any particular courses, but I think through practice I do better and better. I use Grammarly, and that makes things a bit easier. I highly recommend Grammarly to anyone who likes to check the writing fast. There’s also a free plan so you can play with it. A few of my unique articles appeared on Visual Studio Magazine, and also I reposted at dev.to. Visits: 300,541 (50k monthly) - 148.05% more than the previous six months! Unique visitors: 64,823 (~11k monthly) - 113.30% more than the previous six months! This is a bit funny story. Initially, I didn’t plan to write it as it seemed that would be quite a hard topic… describe all the features? Yeah… but then I thought why not use Github/other people and write that in together? Also, it would be impossible to write the complete post in just a day… or even week. So I put my perfectionism aside and just started creating the outline and the framework. And then, once it was live I just needed to fill the holes and keep writing. Plus a few people helped me. The whole article is still not in the final form, more and more content could be added. But You still seem to like it! Thanks. My sixth update about the language! As always it gives me a positive boost at the beginning of the year! 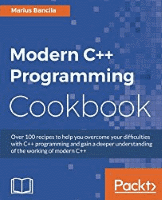 Pseudo Rant/Supportive post about modern C++. While writing code in C++11/14/17 is getting simpler and simpler, it feels like a new language… I still understand the complexity behind. While many samples are much nicer, there are so many new features that people are confused. Especially when you learned old C++, and now everyone tells you to abandon it and be modern. My review of this great book. Moving to the weekly schedule, growing the newsletter, writing about C++17. That’s excellent first part of the year! I haven’t created any survey this time; maybe I’ll do it at the end of the year. What topics would you like to see on this blog? What’s your biggest problem with C++? What’s your opinion about this blog?